Use your assignments in Pivotal Tracker to build your daily work plan in Daycast. Daycast lets you plan your day, inform your team, and track your time against Pivotal Tracker stories and other ad-hoc tasks. 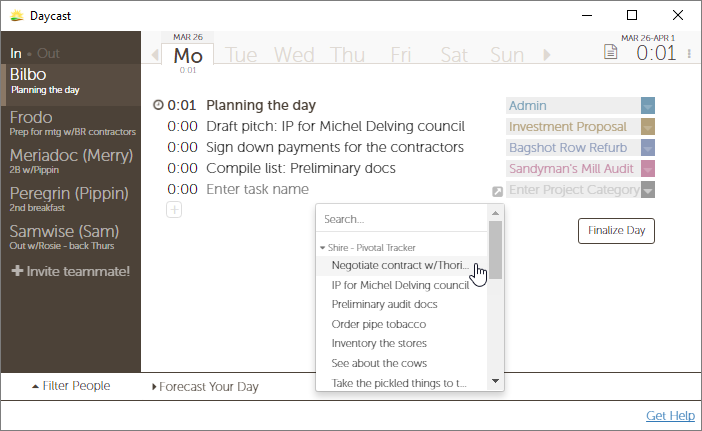 Plan and execute effective workdays with Daycast. Clock in and out of tasks as you work through your day, letting Daycast keep track of your time for you. Your status will automatically update (and can be customized manually as well), giving teammates an up-to-the-minute view of what you’re working on. Plan your day, track your time, update your team—own your day with Daycast.